See what kind of catches we're making week to week! Learn more about each of our boats that you could charter for your fishing trip! Click Here to See Some More of Our Videos! For the best fishing charter in Key West, you’ve come to the right place. 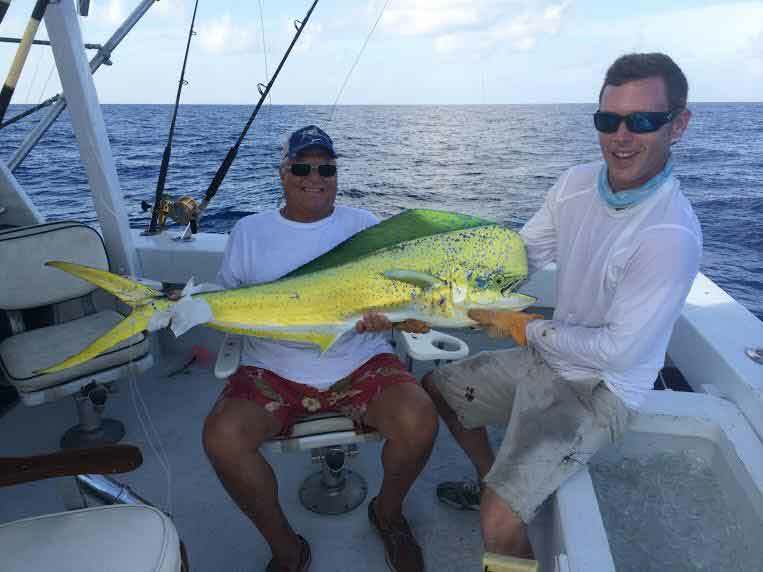 Whether you’re an experienced angler or you’re just looking for a fun vacation day in Key West, you won’t leave our fishing charter disappointed. You certainly won’t leave empty handed! We have a knack for helping people catch all kinds of fish on our fishing charters: tarpon, shark, sailfish, marlin, snapper, cobias, grouper, kingfish, mahi mahi, tuna, wahoo—you name it! Whether you’re looking to do some light tackle fishing or offshore, deep-sea fishing, Captain Moe’s Lucky Fleet has the perfect boat for the job. Our Fleet, located in the Historic Seaport of Old Town Key West, consists of three well-maintained beauties: The Lucky Charm, Reel Lucky, and Reel Lucky Too. Captain Moe built this fleet after spending more than a decade racing some of the largest sailing yachts in the world. His time as a professional ocean racer gave him the opportunity to fish all over the globe: From New Zealand to Hawaii to Cuba and everywhere in between! Needless to say, Captain Moe has good taste in boats. So when it comes to his fleet, these three boats will help you battle it out with some of the biggest fish you’ve ever seen. All of our fishing charter vessels come equipped with top-of-the-line rods and reels specialized for fighting large fish. Don’t miss out on your chance to make the catch of a lifetime! Who works the fishing charter? Captain Moe and his hard-working, fun-loving crew will chart you around the waters of Key West. While you’re sailing the harbor, surrounding flats, channels, patch reefs, or wrecks in the gulf, don’t be afraid to ask for stories of different adventures we’ve had battling fish or exploring the ocean around Key West. The fish are biting and the weather is great. What are you waiting for? If you are looking for a fishing charter in Key West, come on over to Captain Moe’s Lucky Fleet. Call 305-304-8065 today! We chartered two boats from “Reel Lucky” in the middle of July. Best time I have ever had on a fishing charter. Captains were super friendly and super helpful. 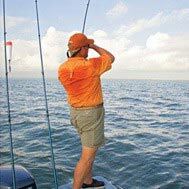 There was no “fishing charter” attitude which can really ruin a trip. This was the first time I landed a fish of that size and the captain was there the whole time guiding me through the process. A real team effort. Capt Moe and mate Ryan worked their butts off to provide my son and I a VERY memorable experience on the “Lucky Charm”. They were both so very, very kind to us (especially my 10-year-old son). We were out for a little bit of “big game” fishing and some fish to take home to eat. The sail fish weren’t biting but Moe seemed to know that before we even put a line in the water. We got several Tuna (unfortunately the “false albacore/bonita” that aren’t edible) and a real nice King Mackerel. We then got a little closer to the reef and absolutely KILLED the snapper. Ryan never stopped hustling and Moe never stopped looking out for us. This was a great day. We did one other charter in Key West this trip and we’ve also fished in Hawaii. We intend to return to Key West next year and Moe will be our first stop! Highly recommend you do the same.